Although Eugenia Bone was perfectly happy with her life as a New York City food writer, she knew that her husband, a transplanted westerner, was filled with a discontent he couldn’t explain. So when he returned from a fishing trip in the Rockies one day and announced that he wanted to buy a forty-five-acre ranch in Crawford, Colorado (population 404), she reluctantly said yes. She then loaded imported pasta, artichokes in oil, and cured Italian salami into her duffle bag, and headed west with her two young children. At Mesa’s Edge is a witty, often moving story of ranch restoration and of struggles with defiant skunks, barbed wire, marauding cows, and loneliness. Eugenia learns to garden in the drought, to fly-fish, and to forage, all the while discovering the bounty of the region. She fries zucchini flowers in batter and dips them in cilantro-flavored mayonnaise, grills flavorful T-bones from the local ranchers’ grass-fed beef, pan-fries trout, fills crepes with wild mushrooms, and makes cherry pies with thick, sugary crusts. Gradually, she begins to adjust to the rhythms of the land. Partly a memoir, partly a cookbook with more than one hundred appealing recipes, At Mesa’s Edge is a transporting tale of rejuvenation, a celebration of everything local, and a reminder that the best food is to be found in our own backyards. 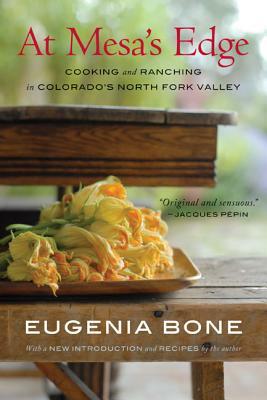 Eugenia Bone is the author of Mycophilia: New Revelations from the Weird World of Mushrooms, Well-Preserved: Recipes and Techniques for Putting Up Small Batches of Seasonal Foods, and Italian Family Dining, written with her father, Edward Giobbi. She also writes a blog for the Denver Post about preserving foods, called Well Preserved.